In August 2016, Colin Kaepernick sat down during the national anthem. Shortly after, US veteran and ex-NFL player Nate Boyer explained that kneeling was more honourable than sitting — so Kaepernick listened, and kneeling during the anthem as an act of protest became a pattern throughout the league. When asked whether he was proud that other players in the NFL followed his protest, Kaepernick said, “This movement wasn’t for me.” In fact, on multiple occasions, Kaepernick has made it clear that the protest has nothing to do with him. On August 27, 2016, an NFL media reporter described Kaepernick’s decision to sit during the anthem as a move to “willingly immerse himself into controversy.” By describing Kaepernick’s actions as “controversy,” the writer implies that the league doesn’t care to hear players speak up and that their opinions amount to unneeded drama and distraction from the sport. That summer had seen the deaths of numerous African-Americans at the hands of police. Delrawn Small in Brooklyn, Alton Sterling in Baton Rouge, and Philando Castile in Saint Paul are just three of the African-Americans who were unjustly killed by law enforcement. And these killings made it impossible for Kaepernick to honour the United States, even if he was a professional football player. Two and a half years later, on February 15, the NFL settled its collusion case with Kaepernick. Kaepernick had not been on an NFL roster since kneeling during the anthem, and he had filed a lawsuit against the NFL on the basis that the league had colluded to keep him unemployed. Ideally, he would make it onto the field as a quarterback once again, having proven that the league had colluded. The settlement suggests that the league feared a guilty ruling, and while Kaepernick will undoubtedly get paid a large sum, the ultimate victory would have shown that one can be Black, openly raise awareness about police brutality, and continue playing for the NFL. A settlement does not promise a roster spot. He has chosen to let others point out why he should still be on the football field. He has not bothered to respond to President Donald Trump’s disrespectful comments. He allowed GQ to publish a feature making him the GQCitizen of the Year in 2017, but refused to be interviewed for the article. He is now the face of Nike’s 30th anniversary “Just Do It” campaign. Kaepernick’s ability to keep his voice and face in the backdrop but have his name circulate all over media shows the magnitude of athlete protest. Athlete protests in the past were usually shut down quickly. Tommie Smith and John Carlos were suspended from the US track and field team after raising their fists during the anthem at the 1968 Summer Olympics. When Muhammad Ali refused the Vietnam draft, he was sentenced to prison, stripped of his championship title, and suspended from boxing in the state of New York. The rationale was that because Ali had made millions off American viewers, there was no reason for him not to show his appreciation by joining the armed forces. Kaepernick knows the risk he is taking as he delves further into controversy and advocacy. He intentionally keeps his voice out of the media because it is not about him. It is about others. Had Kaepernick covered the protest with his words, the conversation would eventually have revolved around him and not the issues that he hopes to help solve. He has since donated $1 million to charity and shows no signs of stopping. Although his future on the football field remains precarious, his continued activism presents an ongoing commitment to underserved African-Americans. 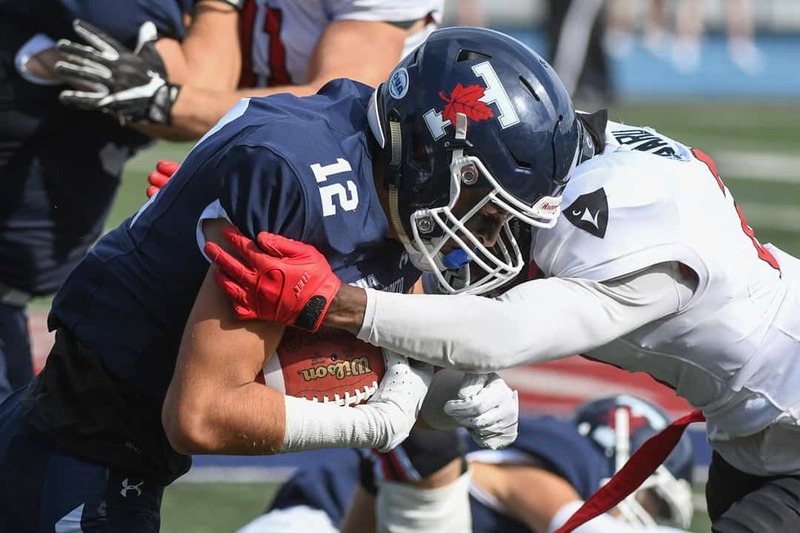 The Varsity Blues football team wrapped up their season with a 31–15 loss against longtime rival York Lions in the 49th annual Red & Blue Bowl on Saturday afternoon. The Lions’ defense opened up the game by forcing a safety less than a minute into the game. York then managed to grab a 3–0 lead with a rouge point converted by kicker Dante Mastrogiuseppe. In the second quarter, the Blues evened the score by capitalizing on a six-play drive that resulted in a field goal. Things turned completely one-sided in the second quarter as the Lions’ offense caught fire. Toronto’s defense looked lost as they gave up 28 points in a span of 10 minutes. Wide receiver Luther Hakunavanhu started York’s 28-point flurry with a touchdown catch, thrown by quarterback Brett Hunchak. The Lions quarterback then connected with his brother, Colton Hunchak, for a three-yard touchdown pass. With less than two minutes to go in the first half, the Lions scored twice to go up 31–3. Running back Kayden Johnson managed to get in the end zone on a one-yard touchdown run. On the Blues’ following drive, defensive back Kadeem Thomas intercepted Vince Luccisano, giving the Lions the ball back. Quarterback Noah Craney found Eric Kimmerly in the back of the end zone to close out a dominant first half by the Lions. The Blues’ only touchdown of the game came in the fourth quarter on a run by running back Max Gyimah. U of T closed the game with a 31-yard field goal by kicker Ethan Shafer to make it 31–15. York’s Brett Hunchak was phenomenal in the game. Hunchak threw for 303 yards along with two touchdowns, completing 26 passes on 38 attempts. Johnson ran for 69 yards and one touchdown. A trio of receivers, Eric Kimmerly, Colton Hunchak, and Hakunavanhu, each caught a touchdown pass. Blues second-year quarterback Vince Luccisano struggled heavily against the Lions’ defense. Luccisano threw for only 72 yards while also throwing three interceptions. Rookie quarterback David Maecker replaced Luccisano in the third quarter, going five-for-10 for 82 yards and only one interception. Blues wide receiver Will Corby ended the season on a high note with eight receptions for 114 yards. A pre-game ceremony and 25th anniversary of the 1993 Yates and Vanier Cup was hosted by the Blues to honour graduating players Connor Ennis, Wade Zanchetta, Ryan Grandell, Patrick Pankow, Jordan Sidsworth, Cole Goodfellow, Wacey Schell, Lamar Foyle, Nick Hallett, and Carter Gladman. The 2018 Blues football season comes to a disappointing end as they were unable to secure a victory, placing them at the bottom of the OUA standings. There’s a simple story regarding how I first started writing for The Varsity’s Sports section. The July before my first semester, I sat across from then-Sports Editor Emma Kikulis in the lounge at The Varsity’s office and shared my ideas with her, in an enthusiastic and nervous fashion, characteristic of an incoming university student. Back then, I wasn’t aware that eventually succeeding her was even a possibility. I was just eager to write about sports. A few days before I attended my first class, I sat in the press box at Varsity Stadium and watched the Blues lose a high-scoring 55–33 game to the McMaster Marauders. Blues running back Divante Smith rushed for 112 yards and scored three touchdowns, while Marauders quarterback Asher Hastings threw for a ridiculous 384 yards and five touchdowns. I couldn’t think of a more entertaining introduction to Varsity Blues athletics. Blues quarterback Simon Nassar, who towered above my audio recorder during the postgame interview, earnestly answered my questions about Smith’s performance and how the team could rebound from the loss. He even mentioned how cool he thought it was that I was covering the football team for The Varsity and thanked me for it. Three weeks later, I was back at Varsity Stadium to cover the Blues women’s soccer team. The Trent Excaliburs didn’t provide much of an opposing force on that Friday evening, as striker Natasha Klasios scored a hat-trick to lead the Blues to a 6–1 victory. However, it wasn’t until I became The Varsity’s Sports Editor as a third-year student that I fully embraced Varsity Blues athletics and understood what the program stands for. That happened after I finished an internship for Vice Sports in April 2017. At Vice, I was educated on Canada’s sports media landscape while working on a story informed by former Ontario University Athletics (OUA) president Peter Baxter on the importance of varsity-level athletics for student athletes and the need for more coverage. After being elected Sports Editor, it wasn’t hard to guess how I wanted to spend the next year of my life. I just couldn’t have predicted how incredible the experience would be. When you reflect on an entire year, you tend to recall the big moments first. It was an easy decision to skip the first day of class and interview Olympic bronze medalist Kylie Masse. Sitting across from Kylie, who admits, “The most important thing for me is enjoying to swim,” she appears likely to be the happiest person in any room with her positive attitude and constant smile. I also won’t forget the day that Kylie broke her own 50-metre backstroke Canadian and U SPORTS record in the preliminaries and then again that same night in the finals at the U SPORTS Swimming Championships. Nor will I forget the roar of the crowd that followed her in each race that she competed in over the three-day event. There was something unique about the brisk fall weekends I spent at Back Campus covering the Varsity Blues field hockey team. Writing about field hockey was a chance to take a break from covering football and soccer and attempt to write about a sport that I initially knew next to nothing about. I stood next to parents who were cheering on their daughters, jotted quick notes to describe the fast-paced action, and overheard returning alumni converse about how their weekend was going. It was liberating to step outside of the somewhat isolating nature of a press box and into a setting where one didn’t exist. During the first game I covered, a parent approached me as I sat in the bleachers and typed notes. He was curious about what I was doing. Like Simon, he thought it was great that I was writing about the game. For the length of our conversation on Blues athletics, I didn’t mind being distracted from the action in front of me. The interviews I conducted are impossible to forget. It was incredible to listen to Blues women’s hockey head coach Vicky Sunohara reflect on her illustrious career and memories of winning two gold Olympic medals and hear Emily Ziraldo’s teammates, Julia Costanzo, Rachel Spogue, and Emily’s twin sister Hilary, describe the incredible person she is on and off the field. After interviewing Blues second-year swimmers Rachel Rodé, Sarah Polley, Hannah Genich, and Sophie du Plessis, all of whom happened to be roommates and won a combined 19 medals at the 2018 OUA Championships, it was inconceivable not to dub them as the ‘Fantastic Four.’ And before speaking to Hannah, I would’ve never considered the idea of hanging medals on a bedroom curtain rod. Then, there are the moments I experienced vicariously through the words of my section’s writers, like Kate Reeve’s engrossing narrative capturing the shared experience of novice and veterans rowers — not to mention coxswains — competing at the annual Brock Invitational Regatta from the start of their journey as they departed Toronto before sunrise. The Sports section came full circle with Julia Costanzo’s reflection on her rookie season as a member of the Blues field hockey team. The year ended with Emily and Blues punter TJ Morton being awarded the inaugural The Varsity Athletes of the Year, as voted upon by the section’s contributors. Julia’s personal essay, “Notes from the dark room,” in The Physical Issue of The Varsity Magazine was impossible to read without confronting how little is actually known about concussions. It’s also the type of sports writing I would have introduced to Emma as an example of why I want to write for The Varsity. Julia’s writing speaks volumes about her own resilient spirit; her essay detailed the difficult experience she went through after suffering a concussion, but was later able to overcome — an attribute fitting for the outstanding athlete she is, but also reflective of the character displayed by her and fellow student athletes. That’s the reason why I believe every U of T student should attend Blues games. Any writer who is passionate about sports, wants to learn more, or is maybe just interested in writing about people should take the opportunity to contribute to the The Varsity’s Sports section for the same reason. I know it’s the most rewarding decision I’ve made so far at U of T.
The Varsity Blues football season came to an end on Saturday afternoon with defeat in their final home game to the Queen’s Gaels. The Blues’ offense started off hot as Blues quarterback Clay Sequeira ran for a 30-yard touchdown and later threw a 22-yard-touchdown to Nick Stadnyk to take a 14–0 lead. The Gaels offense quickly put up points in the first quarter however, with Gaels quarterback Nate Hobbs throwing a 73-yard pass to a wide open Chris Osei-Kusi that resulted in a touchdown. Hobbs later completed four straight passes for 31 yards before capping it off with a 21-yard touchdown to Connor Weir to level the game 14–14. The Blues managed to score only one touchdown in the second quarter. Hobbs was hit by Blues defender Corey Williams, fumbling the ball — a rare mistake from the Gaels’ offense. Brittley Mokube recovered the football for Toronto, running it back for a 30 yards for a touchdown. The Gaels took over in the second quarter with three straight touchdowns along with a field goal to take a commanding 38–14 lead. Hobbs threw for a pair of touchdowns, while Blues quarterback Christian Krcilek threw a pass that was intercepted by Gaels linebacker Nelkas Kwemo and returned it 61 yards for a pick six. The Blues’ defense was no match for the Gaels’ high-powered offense as Hobbs had a near-perfect day completing 32 for 40 passes for 436 yards and five touchdowns. Running back Jake Puskas led all players with 22 carries for 118 yards and one touchdown. Wide receiver Osei-Kusi led the Gaels with 12 receptions for 179 yards and two touchdowns. Sequeira finished the game going 14 for 26 for 282 yards and two touchdowns. He also led the team in rushing with 73 yards. Blues receiver Stadnyk finished with four receptions for 75 yards, along with two touchdowns. A silver lining in the game was Blues fifth-year punter TJ Morton, who ended 2017 with 3,921 yards, breaking the OUA record for punting yardage in a single season held by Guelph Gryphons punter Norman Nasser in 2000 with 3,621 yards. After a long and hard-fought season, the Blues finish their season with a disappointing 1-7 record, missing the playoffs. With the help of a Guelph win over Carleton, the Gaels secured the final playoff spot, finishing with a 4-4 record. Driven, determined, and passionate. In an interview with The Varsity, University of Toronto Varsity Blues running back Cole Goodfellow covers ground on his life and what it means to play football. From being high school MVP to receiving an entrance scholarship to play football for the Varsity Blues, being able to play football means everything to the number 34 Blue. “I feel like football is such a big part of my life now,” Goodfellow explains. Through tough training and maintaining grades, he’s strongly committed to the game he has loved for years. The opportunity to be on the starting lineup shows the kind of athlete he is and that coaches can trust him to execute plays and be a leader on the field. “For me, [being a starter] doesn’t affect [my performance]. Either way I’ve got to be in the game, either way I need to be physically and mentally prepared to step in anytime,” Goodfellow says. Having the opportunity to speak one-on-one with him provides insight on how seriously he takes his role on the Blues. Playing football for many is more than just a game; it’s deeper than just win or loss. Athletes like Goodfellow play their sport out of passion. His favourite part of being a running back is getting past a defender and then scoring. He feels there is no better feeling than dominating the other player in the role they were supposed to dominate and then scoring to put your team ahead. As the season draws to a close, the Blues currently sit in 10th place out of 11 OUA teams. Through the 2017 football season, the Blues have had some tough luck, winning just one of their first six games. However, the team is still poised to come out strong and be prepared for the next challenge. On September 23, the York Lions reclaimed their victory in the 48th annual Red and Blue Bowl hosted at Alumni Field, ending the Blues’ four-year win streak. Starting running back Kaleb Leach had some strong plays as he made 14 carries for 70 yards, while Goodfellow rushed seven times for 46 yards in the game. The Varsity Blues will play their final home game against Queen’s University on October 21 at 1:00 pm. The York University Lions defeated the University of Toronto Varsity Blues football team 41–16 in the 48th annual Red and Blue Bowl to win the Argo Cup at York’s Alumni Field in Toronto. The Lions put together a dominant performance, nearly doubling their first-half total in their homecoming victory. York quarterback Brett Hunchak put together a calm and collected effort, completing 19 of 27 attempts for 244 yards and three touchdowns. Adam Adeboboye had a standout performance, making 14 catches for 140 yards and hauling in two touchdown passes. Blues quarterback Clay Sequeira started the second half over regular starter Connor Ennis for Toronto. Sequeira completed 10 of 19 pass attempts for 225 yards, threw one touchdown, and made one interception, while Ennis threw for 54 yards, completing five of nine passes. Sequeira was constantly under pressure and was forced to scramble often, running for 30 yards on three attempts, and he also provided the Blues with their lone rushing touchdown of the night with 10:01 left in the third quarter. Jaykwon Thompson provided the Blues with their best highlight of the game. Thompson made a quick catch and broke free for an 85-yard touchdown reception in the fourth quarter. The rookie receiver made five catches for 130 yards. Blues running back Kaleb Leach returned to action against York and ran for 70 yards for 14 attempts. The Blues return to action October 5 against McMaster University at Varsity Stadium. On Saturday, September 16, the Varsity Blues played host to a dynamic Guelph Gryphons offence, which had put up 81 points the previous week against Windsor. Led by quarterback James Roberts, the offensive juggernaut picked up right where they left off, putting up a total of 333 passing yards and 179 rushing yards. The Blues offense only managed to score six points in a 43–6 blowout loss. Toronto’s only offensive team score came in the form of a field goal at the beginning of the second quarter. Their defence also managed to force Guelph to take an intentional safety, and their special teams managed to score a single off a punt. Toronto’s best offensive performance came from wide receiver Nick Stadnyk, who had four catches for 74 yards, and made their biggest play of the game, catching a 28-yard pass late in the first quarter, leading to a field goal. The Blues’ next game is on Saturday, September 23 at Alumni Field against York University.